“I know time has come for all of us to leave. Let’s start our journey together, one after another. 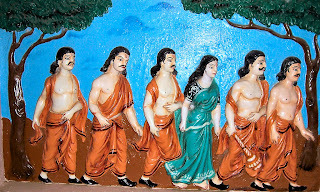 Follow me my brothers and O princess of Panchala” said Yudhishtir, preparing for their final journey to heaven abode. “In this journey, no one shall turn back when someone falls” , reiterated Yudhistra. 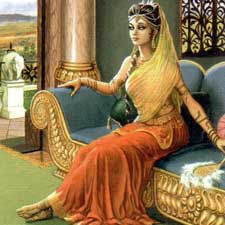 Bhima glanced at Draupadi. She was as non-chalant as ever. Did she love him as much as he loved her? He wanted to ask Draupadi so many questions. Images of his conversations with Draupadi, during the Ashwamedha Yagna and Kichaka vadha were flashing in his mind. Draupadi never showed her love for him. Did she love him at all? He did not dare to ask her. For he never wanted to be the reason behind those tear drops that kissed her cheeks. Krsnaa, Paanchaali, Yajnaseni, Mahabhaarathi, Sairandhari, also better known as Draupadi, the symbol of self - confidence, beauty, devotion and virginity is full of surprises and questions when dwelt upon. “I wont rest until the blood of the sinning Duchadhanan and Duriyodhanan have caressed my hair . Until that day comes, my hair shall remain the way it does today, unbraided, uncared for just like I am today.” So says Draupadi according to the Tamil poet Bharathiyar in his Paanchali Sabadam.